There certainly is a nip in the air now that autumn has rolled around, but while there are many who believe that Halloween and Bonfire Night should take centre stage before even thinking about Christmas, we say it's time to start planning for the most important event now. From large homes which can accommodate the whole family and the festive feasts that go along with them to romantic boltholes far from the hustle of bad traffic and seasonal small-talk, we’ve got a luxury homestay to suit every flavour this festive Christmas. What better place to gather the brood than in a grand house surrounded by magical gardens and within strolling distance of the sea? Congregate around Butterfield’s piano for carols and mince pies on Christmas Eve, join the locals in the brisk tradition of a Christmas morning swim in the surf (without a wetsuit, of course!) and settle by the fire while the smell of duck far roasted potatoes drifts through the house. There’s something rather satisfyingabout lighting a fire and kicking back with a Christmas Port as the British winter rages on outside, and there is no finer place to do this than at The Find in the heart of Gloucester. Floor-to-ceiling windows allow for the most festive of scenes as snow falls in the garden while children open presents in their pyjamas under the tree. Sleek, open-plan living allows everyone to be together whether prepping canapes in the kitchen, playing board games on the dining table or curled up in pyjamas watching a Christmas film. Designed with multi-generational families and celebrations in mind, Kingfisher Farm is the perfect retreat for the whole gang to come together. Watch deer amble through the morning ground mist over the first cup of tea of the day before children bound down the stairs, stockings filled with presents in hand, to open by the log burner. After lunch, work off that extra handful of pigs in blankets with a stomp across the Dorset coast path before returning to the snug for a marathon of Father Ted, Grandad snoring in the corner. If you are dreaming of a fairytale Christmas worthy of rom-com blockbuster status, look no further than The Fable. Enchanting and whimsical, this romantic Cornish retreat is the perfect cottage to shut out the rest of the world and indulge in a small and intimate Christmas. As wonderful for small families as it is for couples, this charming homestay set within Poldark country will create yuletide memories to last a lifetime. 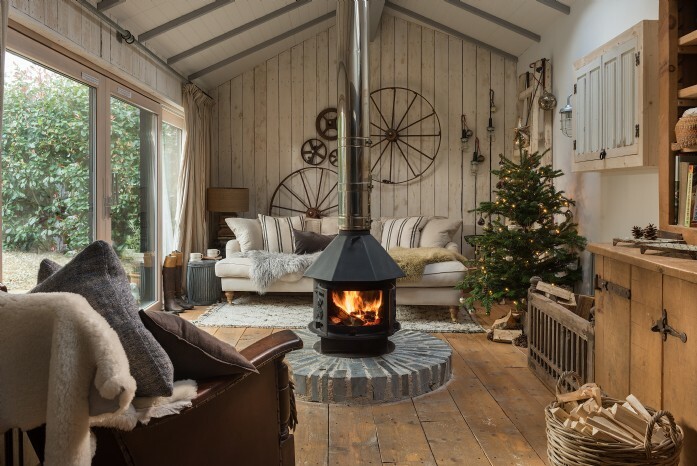 Encouraging long lie-ins and good conversation around the fire, The Wool Shed is a rustic abode in off-the-beaten-track Cornwall which really comes into its own during the festive season. Twinkling lights, an impeccably decorated Christmas tree and a smouldering woodburner in the centre of the luxurious living area make this home a comfortable hideaway for four. If there was ever a Christmas Day with Instagram appeal, Christmas Day at The Wool Shed is definitely it. With a piano and plenty of roaring fires, huge soft sofas and even an indoor swimming pool, there really is something for the whole family at Christmas in Castle Trinity. The sweeping staircases offer a grand spot for the traditional Christmas jumper family photograph while budding chefs will be in their element when prepping and roasting the day’s main event. 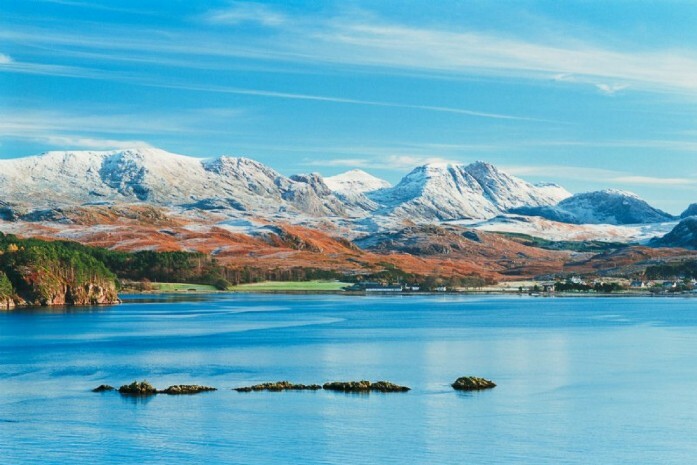 We all dream of a white Christmas, and there is nowhere surer of snow in the UK than the faraway Highlands and Islands of Scotland. Tucked away on the shores of Loch Ewe, with views across the water to the soaring Munroes beyond, Skyfall promises a winter wonderland retreat for couples seeking solitude. After exchanging gifts, make lunch together while sipping Scotland’s finest single malt before snuggling up on the sofa, toasting toes wrapped in festive socks by the woodburner.